If you are using WordPress and need a gallery program, NextGEN might be a great choice for you. You can have multiple galleries and albums and it is pretty easy to use. 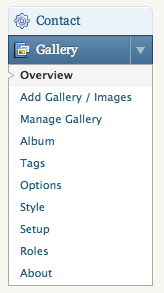 After you login to your WordPress admin area, you should find a new item on the left side named “Gallery”. Galleries are a collection of pictures. You can have multiple galleries. Albums hold one or more galleries. In this overview you can see how much Images you uploaded, and how many Galleries and Albums you created. Before we can upload images, we have a gallery. If you haven’t created a gallery before, then you’re in the right tab (“Add new gallery”). If you allready have created other galleries, then you have to select the “Add new gallery”-tab. Fill in the name of your new gallery and click the “Add gallery” button. There are 2 ways to upload images to a gallery. You can upload images from a folder on our computer or you can upload a zip-file with images. This way we can select 1 zip file containing a lot of images. I’m not a fan of this way of working: depending on your server settings, the max size of files you want to upload can be very limited. This is the result of inserting an image gallery in it’s most basic version. For a lot of users (and I’m one of them) the basic options will be just fine. If you want to change the options, just take a look at the options (select “Gallery” > “Options” in the left menu). To change the options of a slideshow, select “Gallery” > “Options” in the left menu, and then select the “Slideshow”-tab. Note the “Back” and “Next” buttons! A lot of people want to add the lightbox effect to NextGEN Gallery. Out of the box, this won’t work and the result is a lot of frustration. I’ve seen a lot of solutions on several forums, but none of them was a really simple solution. The good news is that it’s actually pretty easy to add this lightbox effect to NextGEN Gallery! WP Lightbox 2 is a plugin that adds the lightbox-effect to your images. Install WP Lightbox 2 and activate this plugin just as every other plugin. That’s it, if you now insert a gallery as image list, it should work! I hope this tutorial made it clear how to create a new gallery and how to show it on your page or post. By now, you’ll probably know this plugin has a lot to offer. This makes NextGEN Gallery a very versatile plugin which can be used by beginners AND advanced users.